During a discussion at one of our Canadian NGOs that we were visiting, the question was asked by one of our international colleagues about advocacy and the role of service organizations, especially on issues like detentions. Read more of Debbie's observations on advocacy and the role of service organizations. The Resilient Neighbourhood Economies Project in Thorncliffe Park is part of the multi-year pilot project developed by the Metcalf Foundation in collaboration with the Centre for City Ecology. The aim of this project is to improve the economic opportunities available to low-income people in two Toronto neighbourhoods, Kingston-Galloway Orton Park and Thorncliffe Park. The ESL Corner is a clear language tool that aims to help improve vocabulary and comprehension skills of newcomer English language learners. 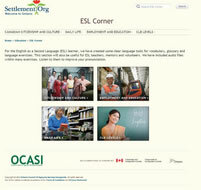 To access the ESL Corner, visit Setttlement.Org. OCASI, together with Metro Toronto Chinese and Southeast Asian Legal Clinic and Colour of Poverty - Colour of Change, has submitted a joint report to the United Nations Human Rights Council for consideration at the Universal Periodic Review (UPR) for Canada. The joint report is focused on the impact of legislation and public policy on refugees, immigrants and racialized communities. It highlights human rights concerns about changes to refugee determination and the immigration program, as well as other issues of access and equity and makes recommendations for change. 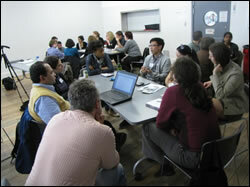 A new page entitled Language Training was created recently on the SettlementAtWork.Org wiki to organize and centralize resources on settlement language training. The page is home to all resources on the wiki relevant to settlement language training, replacing and expanding upon the frequently visited "LINC documents" page. The new page is geared towards both language training practitioners and administrators. Visit the Wiki page to find these resources. The Expert Roundtable on Immigration consisted of leaders from the private sector, the settlement services sector, academia, and the not-for-profit sector. The Roundtable's mandate was to advise the Minister of Citizenship and Immigration on the development of an Ontario immigration strategy that addresses immigrant selection, settlement, and integration issues, with an emphasis on economic immigration and labour market integration. Read the executive summary or the full report. This new report from Maytree describes how, from 2008 to July 1, 2012, the federal government has made changes to every aspect of immigration policy, including the way in which reform is undertaken. The report puts forward that these changes could have a significant impact on both the social and economic fabric of Canada and how the country is perceived by potential immigrants from around the world. Read the full report (PDF) or consult the Q&A document (PDF). For more information or to register, please visit the event website for more.